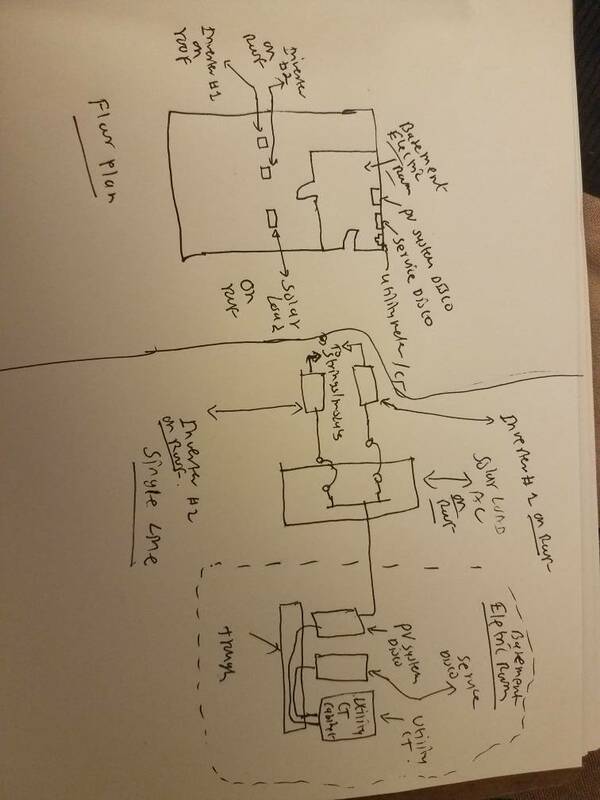 Attached sketch shows tap from utility CT to trough to PV disconnect in electrical room inside basement. However from PV disconnect goes straight to roof to switchboard named solar load. From switchboard feeder breaker goes to inverter on roof to strings and modules. My question is does code require disconnect between PV disconnect and solar load switchboard outside building? But check with your POCO. We have worked with some that require an exterior PV system disconnect. It can be a real pain for larger systems. Most requirements for the exact PV disco. location are set forth by the utility. I believe the code mentions a means of disconnect to be in a readily accessible area which includes a locked door in some instances. I rarely see a tie in at the utility ct cabinet. Most utilities are against this. They want a clear distinction between utility and customer/solar. In my case the utility service is underground into building basement electric room trough amd the inverter and solar panels are on roof. Tap from CT is second issue but first issue is I am confused between NEC 2014 695.15(A)(2) and 695.15(A)(3) one says ac disco within sight of inverter which is the solar load switchboard on roof on sketch and other say additional ac disco need to be per 690.13(A) which could be pv system disco in the sketch? Not sure what the code means by an additional disco 695.15(A)(3)? So yes, your main PV disconnect at the service is your 'additional' one. It can also meet the requirements of 705. If the utility makes you put in another external one then that one can meet all those requirements. Tap from CT is second issue but first issue is I am confused between NEC 2014 690.15(A)(2) and 690.15(A)(3) one says ac disco within sight of inverter which is the solar load switchboard on roof on sketch and other say additional ac disco need to be per 690.13(A) which could be pv system disco in the sketch? Not sure what the code means by an additional disco 690.15(A)(3)?